More recently, SAR researchers and professionals have also cited a need for proactive incident prevention as a critical responsibility, known as preventative search and rescue (PSAR, Hung and Townes 2007). Each of these components of SAR are inherently spatial and should be evaluated in light of emerging technology and theoretical advances in spatial sciences. If Geographic Information Science (GIScience) is the theory behind the development, use, and application of geographic information systems (GISystems; Goodchild 1992), then SAR is an ideal topic for GIScientists to study. Below are abstracts from my current research and just a few examples of how GIS can be applied to SAR and how we can learn much about GIScience in the process. 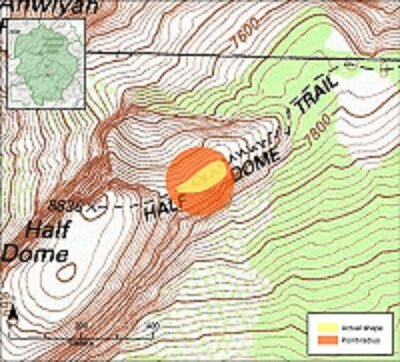 The Search and Rescue (SAR) of individuals who become lost, injured, or stranded in wilderness presents a unique and worthwhile spatiotemporal challenge to investigate. Once incidents are georeferenced they can be spatially queried and analyzed. However, one major challenge for evaluating SAR in a spatial context is the lack of explicitly spatial data (addresses or coordinates) for historic incidents; they must be georeferenced from textual descriptions. 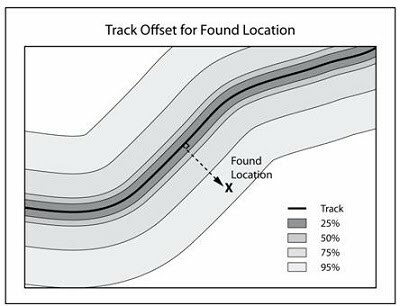 This study implemented two established approaches for georeferencing incidents, the ‘Point-Radius’ and ‘Shape’ methods. Incorporating uncertainty measurements into a spatial database allows for more appropriate analyses of spatial dependence and the spatial distribution of incidents. 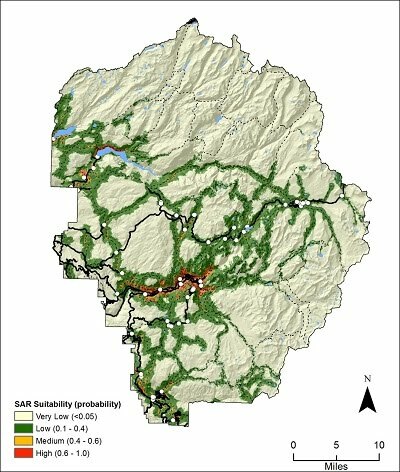 From 2005 – 2010, 1271 of 1356 Yosemite Search and Rescue YOSAR incidents (93.7%) could be georeferenced using the Point-Radius Method, with mean uncertainty radius = 560 ± 51 meters and mean uncertainty area of 3.60 ± 0.840 km2. However, when the Shape Method was applied to six case studies by considering the reference object shape, the uncertainty areas were reduced considerably (by up to 99.5% of the uncertain area generated by the Point-Radius Method). This is the first spatially‐explicit study of SAR incidents and yields valuable insights into the role of georeferenced data in emergency preparedness. Landing a rescue helicopter in a wilderness environment, such as Yosemite National Park, requires suitable areas that are flat, devoid of tree canopy, and not within close proximity to other hazards. The objective of this study was to identify helicopter landing that areas are most likely to exist based on available geographic data using two GIScience methods. The first approach produced an expert model that was derived from pre-defined feature constraints based on existing knowledge of helicopter landing area requirements (weighted overlay algorithm). The second model is derived using a machine learning technique (maximum entropy algorithm, Maxent) that derives feature constraints from existing presence-only points, i.e. geographic one-class data. Both models yielded similar output and successfully classified test coordinates, however Maxent was more efficient and required no user-defined weighting that is typically subject to human bias or disagreement. The pros and cons of each approach are discussed and the comparison reveals important considerations for a variety of future land suitability studies, including ecological niche modeling. The conclusion is that the two approaches complement each other. Overall, we produced an effective GISystem product to support the identification of suitable landing areas in emergent rescue situations. To our knowledge, this is the first GIScience study focused on estimating the location of landing zones for a search and rescue application. In order to address a spatio-temporal challenge such as incident prevention, we need information about the time and place where previous incidents have occurred in the past. Using geographic coordinates of incidents occurring in the past in coincidence with spatial layers corresponding to environmental variables, we can produce probability maps in geographic and temporal space. 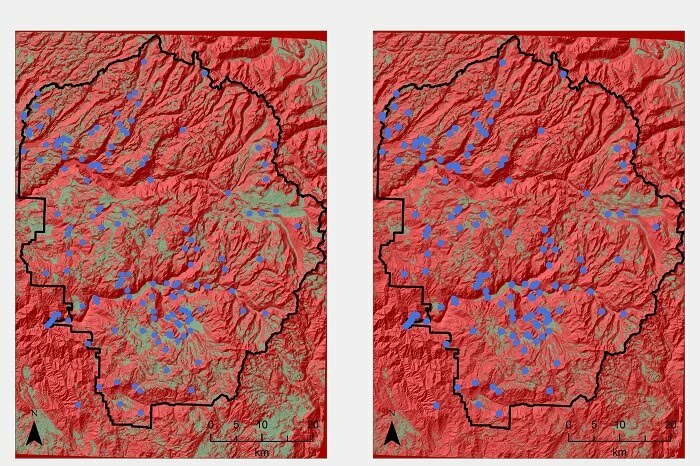 Here we evaluate spatial statistic and machine learning approaches to answer an important space-time question: where and when are search and rescue (SAR) incidents most likely to occur within Yosemite National Park in the future? We have produced a probability map based on the presence and background learning algorithm (PBL) that successfully forecasts the location of future SAR incidents based on environmental variables (distance to anthropogenic & natural features, vegetation, elevation, and slope). This will allow decision-makers to allocate resources where and when incidents are most likely to occur. In the process we not only answered questions related to a real-world problem, we used novel space-time analyses that help us learn more about what factors are associated with SAR occurrence. The GIScience findings from this applied research have implications for best-practices in future space-time research in the fields of epidemiology and ecological niche modelling. 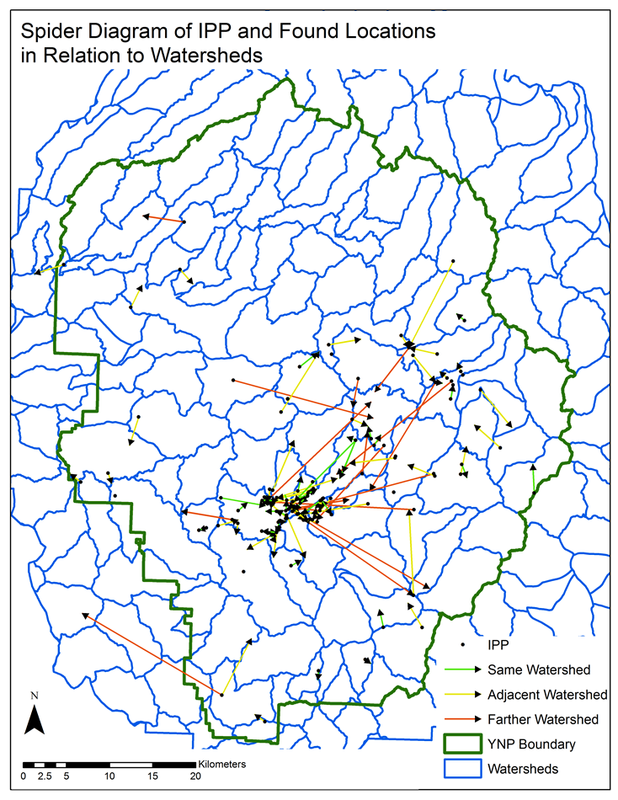 Locating missing persons is an inherently spatial problem and can benefit from both applied and theoretical time geography research. Search and Rescue (SAR) operations range in complexity from simple searches, involving just a few people on foot, to large-scale operations involving hundreds of individuals, search helicopters, and scent-tracking dogs. No matter the extent of the operation, the goal is always the same, to find the lost subject and return them to safety as swiftly asin the shortest amount of time possible. It is important to locate the lost individual quickly because the longer the person is exposed to the elements, the more likely they are to become severely injured or die (Adams 2007, Koester 2008). Here I will describe the a common search operation workflow. When a report of a lost person is made, authorities conduct initial interviews with those making the report. Officials then determine the search urgency of the situation (search urgency) based on current weather conditions and the experience level and demographics of the lost person (Dill 2010). Trail blocks are then established in order to contain the lost person and a hasty search is performed at the Initial planning point, or IPP. The IPP can be defined as the point that is initially used to plan the search incident. This point can be either the original Point Last Seen (PLS), the location the subject was last seen by an eyewitness, or the original Last Known Point (LKP), a location at which a significant clue places the missing subject. If the lost person is not found within the first few hours, then a search planning specialists may be brought in and a more in depth investigation will take place. Search perimeters will be determined and search segments established. Specialty teams such as scent tracking dogs, helicopters, and trackers will often be utilized. The operation will continue to escalate until the subject is either found or until a situation is presented in which it is necessary to scale down the search or discontinue it all together. This is not uncommon, as most searchers are volunteers on their own time and at some point a decision is made that benefits of searching (likelihood of detecting a viable person in need of help) do not outweigh the cost (time, money, risk of injury). A geographic information system (GIS), “a computer-based system to aid in the collection, maintenance, storage, analysis, output, and distribution of spatial data and information” (Bolstad 2008), can be used to improve the speed and efficiency of a search and rescue operation. A GIS can be used to draw search segments, calculate slope and aspect of a potential search area from a Digital Elevation Model (DEM), and analyze aerial imagery in order to interpret land cover and potential hazards. 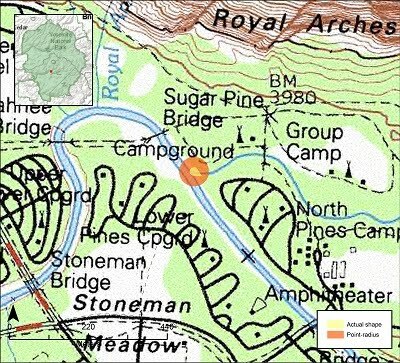 Resources used for the search can also be easily managed within a GIS. In addition, global positioning system (GPS) tracks can be plotted showing where search teams have been and highlight areas that may need to be revisited.